New Year’s Day is right around the corner. And when you round that corner, you’re going to fall off the ledge of 2017 into the Atlantic Ocean. It’s going to be cold, but exhilarating and downright awesome. That’s right – it’s our annual Coney Island polar plunge! Okay, I lied. It’s not going to be “cold”. It’s going to be absolutely frigid – about 12°F when we hop into the water. Last year, it was in the low 40’s. So if you’re planning on plunging, it’s important that you come to Coney Island prepared! Below are some tips from some fellow fitness enthusiasts/maniacs to help stay warm (and safe!) before and after the plunge. I’m not suggesting you do all of the tips, although I do, just pick whatever you think may help you personally. Tip #3- Bring a thermos full of any warm beverage. Tip #4- Don’t drink alcohol directly after plunge, thinking it will warm you up! It will only backfire. It warms you up for a quick moment and then cools you down quicker in the end. ***Note- If you want to drink alcohol then wait until warmed up and in the restaurant or someplace warm. Tip #5- If you have water booties (like diving booties and/or scuba gloves, which helped me when it was cold, then bring them. You’re hands and feet will thank you… Well, if they could talk. Tip #6- If you’re going to dunk your head under water then wear a swim cap. So, you don’t get a head freeze. (My friend, Noel got a head freeze the 2nd time I took the plunge and it was super scary to watch him go through that. Tip #6- Apply olive oil all over your body at least 30 minutes to an hour before you put on your clothes, to give the oil a chance to seep into your skin. ***NOTE- I suggest olive oil because it had a lot of heating elements unlike coconut oil, which I LOVE, but it freezes up in cold weather. Bring warm dry clothing, a bag or 2 for your wet things, and most importantly have fun!!! I know a lot of you are concerned with the low temperatures on New Year’s Day. I admit that the coldest I did my polar bear was at 25°F or a bit lower (17°F or so with windchill factor). For those who want to do it, I would say that it can be done and you don’t need to suffer. When you plunge, you will feel warmer (’cause the water temps will be almost double). Keys for having a great time must be done right before and after the plunge. Before you plunge, have hand warmers/toe warmers ready (remove them from the package) and have your towel + dry clothes out. When you are out from the water, dry your hair and put a warm hat on immediately. Drink something warm. I always pack hot chocolate in a thermos. People think it’s overkill but nothing beats a hot drink after the plunge. That’s it. I survived the plunge every year even when I was really sick. It’s all up to the preparation. Enjoy. As for my own additional bit of advice: I like to bring two sets of dry clothes: one for changing into on the beach, and another for the bathrooms. You’ll want to layer up and warm up as soon as possible when you run out of the water, but you might get some of your clothes wet in the process. If that happens, you’ll have a nice backup set of clothes to change into on the boardwalk! 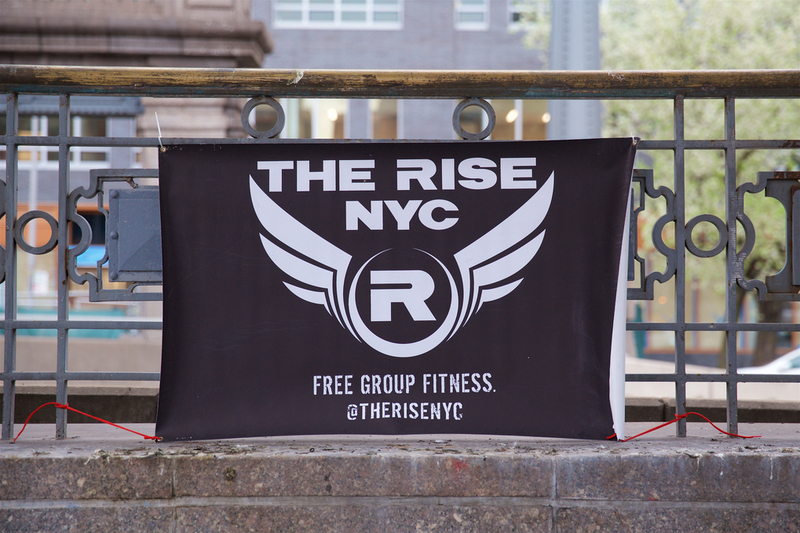 6:30-7 AM: HIIT @ Washington Square Park! Check out the description here. 9:30 AM: The Plunge! We’re walking straight onto the beach from 1229 Riegelmann Boardwalk. The cool kids start sweating with us at 6:30. See you in 2018!